CNG: The Coin Shop. MYSIA, Kyzikos. Pharnabazos. Persian military commander, circa 398-396/5 BC. AR Tetradrachm (22mm, 14.67 g, 2h). MYSIA, Kyzikos. Pharnabazos. Persian military commander, circa 398-396/5 BC. AR Tetradrachm (22mm, 14.67 g, 2h). FAR-N-[A]-BA, head of Pharnabazos right, weaing satrapal cap tied below his chin, and diadem / Ornate ship’s prow left, decorated with a griffin and prophylactic eye; before and aft, two dolphins downward; below, tunny left. Maffre 5 (D5/R4) = Bozdek 7 (this coin); Winzer 9.3; SNG France 395; SNG von Aulock 1216; BMC 12; Franke & Hirmer 718. Good VF, toned, slightly granular surface. Very rare, Maffre located thirteen extant examples, eight of which are in museum collections. Ex Giessener Münzhandlung 69 (18 November 1994), lot 276a. Pharnabazos, a member of the Persian nobility, was satrap of Hellespontine Phrygia, which later became the satrapy of Daskylion. In 399 BC, a war between Sparta and Persia ensued. Agesilaus, one of the Spartan kings, attacked the satrapy of Hellespontine Phrygia. Though hard pressed by the Spartan invasion of his territory, Pharnabazos was able to organize the Persian fleet under the command of the mercenaries Konon of Athens and Evagoras of Salamis, and destroy the Spartan fleet at Knidos in 394 BC. At the same time, he assisted Athens with financial aid to further undermine the Spartans. The land campaign, however, was less successful and the war dragged on. The arrival of a Spartan delegation at the Persian capital resulted in a peace treaty and, contrary to the wishes of Pharnabazos, a renewed alliance. For all of his work, Pharnabazos was recalled from his satrapy and married to the king's daughter, Apame. This exceptional coinage of Kyzikos was struck during this period of warfare between the Spartans and Persians. The issue commenced after Pharnabazos received the responsibility for the management of the Achaemenid navy in 398 BC, and ended with the temporary closure of the mint in 396 BC due to the Spartan presence in the area. Maffre's die study suggests that, although only thirteen examples are known today, the coinage was quite massive. Echoing the earlier observations of G. Le Rider and O. Casabonne, Maffre discounts the temptation of earlier numismatists to assign the coinage to a special emission commemorating a specific naval victory. Instead, the sheer size of the emission suggests that the issue was likely used to finance Pharnabazos' navy in general - not only the construction and maintenance of hundreds of ships, but also the service of thousands of men. 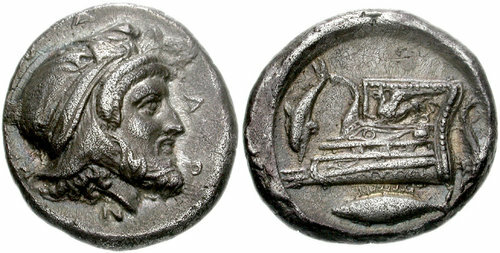 While the coinage did not commemorate a particular naval victory, it was instrumental in facilitating Pharnabazos' naval success that culminated in the Battle of Knidos.